Screenshot, Bild. 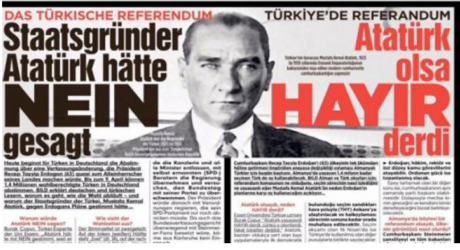 March 27, 2017.Why did this centre-spread in the BILD newspaper instruct Turkish voters that the founder of their new Republic, Mustafa Kemal “Atatürk” (pictured) would have voted NO in the recent referendum? BILD, owned by the media giant Axel Springer, is the largest circulation newspaper anywhere outside East Asia. In the first place, understanding what Atatürk was up to confuses many. He followed the ideas of August Comte at the Paris École Polytechnique, mentor to many of the French-trained élite officer corps who helped him carry out the coup in 1908, though not Atatürk himself. It was Comte’s ideas about “rational religion” that he sought to apply to Islamic practice to generate a strict moral code he would maintain was a genetic Turkish characteristic. This ideology of state supervision by a Soviet-style “Directorate of Religious Affairs”would later be called Ataturkism by 1980 coup leader General Kenan Evren. It could be argued that the straightjacket of Ataturkism, which would not allow for variations in belief (viz. Alevis) or ethnicity (viz. Kurds), together with its aggressive policing, still lies beneath Turkey's divisions today, prompting the political psychosis of what Kerem Oktem refers to as an “Angry Nation”. Atatürk ruled through a single party, the Republican People’s Party (CHP), which is the current bitter opponent of the Justice and Development Party (AKP) founded by Erdoğan in 2001. From the 1930s onwards, the Ataturkist (or Kemalist) élite sought to emulate the “good” European idea of a multi-party system, which stuttered forward in a continuous stream of opposition parties. But these would invariably be closed down, one after the other, when judged unsuitable by a tutelary military. In short Atatürk, the iconic figure who wrested the Turkish nation from imperial aggression, was hardly a paragon of tolerance and democracy. Why then did BILD feature him in this way? A clue may be found in an announcement made by Bruno Kahl, head of the Bundesnachrichtendienst (BND), Germany’s spy agency, in the run-up to the referendum. Kahl announced that Erdoğan’s principal antagonist, the Pennsylvania-based cleric Fethullah Gülen was not behind the July 15, 2016 attempted coup in Turkey. The Gülenist organisation, according to him,‘...is a civil organisation that aims to provide religious and secular education’. This certainly contradicts Stuart Smith at the US Consulate in Istanbul who a decade before had compared this organisation to that of a mafia (as revealed in the Wikileaks cables), an assessment echoed independently in several books by journalists such as Ahmet Şık (in The Imam’s Army), Nedim Şener and Soner Yalçın and former police chief Hanefi Avcı (in The Simons Living on The Golden Horn). These writers would all be arrested on trumped up charges by prosecutors belonging to the Gülenist organisation: now exonerated, they have all recently been released. Kahl at the BND made what amounted to an essentially supportive and conciliatory political statement regarding the Gülen organisation, nine months after the coup, and weeks before the upcoming April referendum, presumably to have some kind of effect on the referendum outcome. Why would Kahl come out of the shadows to say these things? We need to look at the role of the press and the link between BILD, the press in general and the BND in Germany. BILD is the tabloid representative of the German political right, owned by the Axel Springer Group. Udo Ulfkotte has documented how in the 2005 elections which brought the CDU/CSU to power with Merkel at the head, Gerhard Schröder, leader of the left of centre Social Democratic Party (SDP), complained bitterly of a media stitch up at the centre of which stood Axel Springer and BILD. In the late 1960s, Axel Springer had led the charge against the student movement. When student activist and leader Rudi Dutschke was gunned down in 1968, his followers and many in the community at large blamed BILD headlines for inciting the public to violence against him and other individuals in the student movement. The entire stable of Axel Springer publications instructs its journalists to abide by an extraordinary ideological contractual code, which commits them to taking the fight to “religious extremism” (however defined by editorial edict), to defend America and “transatlanticism”, and to protect the State of Israel. There is no reference to ‘journalistic values’ in the code. Udo Ulfkotte’s book Gekaufte Journalisten describes the pervasive influence on the German press of the BND, and its subservience to the CIA. As editor of Frankfurter Allgemeine (FAZ), Ulfkotte’s description of the sheer extent of BND interference in what was, unlike the Alex Springer newspapers, an independently owned and edited newspaper is astonishing. The BND would rent rooms near the paper’s offices where their own staff would write the stories Ulfkotte admits he had to accept and publish wholesale. He goes into detail about the BND’s ‘... pervasive influence on literati, musicians, publishers or public broadcasters’, an account corroborated by many, including the retired head of German broadcaster ZDF, Wolfgang Herles. The German government and the EU were clearly against Erdoğan’s constitutional amendments and had published legal opinions decrying them as a ‘dangerous step backwards for democracy’. But if Ulfkotte’s description of how the BND operates is correct, the overt campaign against the YES camp led by BILD, and which included ARD TV broadcasting in both German and Turkish during the referendum, was accompanied by a more covert one. European institutions waited in the wings to weigh into the fray in the aftermath of the referendum result in the event of a victory for Erdoğan and the YES camp. Within an hour of the result, which saw a 51.4% win for YES out of 49.7m votes cast (from a total electorate of 58.3m), the Organisation for Security and Co-operation in Europe (OSCE) declared the campaign unfairly biased towards the YES camp. Various EU institutions made rapid fire announcements demanding transparency. In Turkey, the CHP, whose leader Kemal Kılıçdaroğlu had so far failed to use his party’s resources in an energetic campaign, sprang into action and now sought the referendum’s annulment. Kılıçdaroğlu based his demand on the Electoral Board (YSK)’s acceptance of “unstamped” ballot papers as valid. No soorner were the CHP’s complaints filed, than a stream of images about contraventions filled social media, chatter mushroomed and the YSK was charged with being in Erdoğan’s pocket. Newspapers globally carried claims that the ‘... supreme election board unexpectedly decided to accept ballots without the official seals’. The YSK, on the other hand, said that all ballot papers without exception carried the official watermark and the voter’s own mark. An additional stamp had been missing on a few occasions due to the failure of some officials to do their job. This, said the YSK head, could have been due to ‘... error, neglect or manipulation’. It had occurred in past elections when the CHP itself had advised overlooking the problem, since not accepting the ballots would unfairly penalise the voters in question. As it was, the audit confirmed the correct total number of ballots counted originally supplied to the polling stations. The NGO ‘Vote and Beyond’, formed to improve transparency in Turkish elections after the Gezi Park protests, detected inconsistencies in a mere 0.22% of the total vote count, or 100,000 ballots (the difference between the YES and NO camps was close on 1.5m). The indecent haste of EU institutions, whether the OSCE or the Council of Europe Parliamentary Assembly (PACE), to discredit these democratic procedures without waiting for the YSK to make their statements, tells its own story. These are institutions who give unqualified support to Israel and the current Egyptian junta, and who according to, for example, Richard Youngs' assessment of the EU’s role in world politics, pursue policies which are ‘...increasingly illiberal... [using] the ostensible principles of multilateralism as a means of shoring up its own relative power in a more multipolar world... [and seeking] containment of, rather than forward-looking engagement with, political Islam’. What role did the messages put out by Kahl and BILD play in all of this? Atatürk is a totemic figure in ultranationalist circles, and Gülenists, to whom they were appealing, are largely ultranationalist. They are, furthermore, deeply ensconced in Turkish coup history. Gülen backed the 1980 military coup by General Kenan Evren, and became a purveyor of Ataturkism at a time when the west was panicking about Khomeini’s 1979 Islamic Revolution in Iran. Much later Gülen would back yet another military coup, this time in 1997 against his supposedly close friend and ally, Islamic politician Necmettin Erbakan. With this background in coup-culture, Gülen joined Erdoğan in the AKP project in 2001, until they fell out when Erdoğan launched the “Kurdish Opening” in 2009, which sought to make inroads into Turkey’s Kurdish problem by legalising the use of the Kurdish language, launching Kurdish studies in schools and universities and allowing Kurdish media. The Kurdish Opening involved a reconciliation process with the Kurds which, as an ultranationalist, Gülen couldn’t stomach. It involved trying to defuse the situation with the militant Kurdistan Worker’s Party (PKK). Gülen’s followers in the police wiretapped Hakkan Fidan, Erdogan’s MİT chief, while he met with PKK representatives in an Oslo hotel on five occasions between December 2009 and January 2010. They released the tapes to the press on the basis that the government was negotiating with a proscribed terrorist organisation, causing a furore in nationalist circles. Gülen later tried to have Fidan arrested on that charge while Erdoğan lay in hospital. Ever since, he and Erdoğan have been enemies, while Gülen’s followers in the police and judiciary are accused of laying ambush after ambush for the Turkish leader. The Kurdish issue has always been at the centre of Turkish politics, exploited by factions in and out of country for different political ends. The April referendum was no different. In order to pass the legislation for the referendum campaign in parliament the AKP had no choice but to partner the Nationalist Party (MHP) with Devlet Bahçeli at its head, given the refusal by Kılıçdaroğlu and the CHP, and by the HDP, to countenance such a move. However, while Bahçeli delivered the necessary votes in parliament to pass the referendum law, his grassroots deserted him. In fact, the NO campaign was more energised by a dissenting group of MHP members of parliament than a lacklustre CHP. Meral Akşener, Koray Aydın, Ümit Özdağ, Sinan Oğan and Yusuf Halaçoğlu had earlier tried to remove Bahçeli as leader but failed. Erdoğan is used to securing the Anatolian vote in its entirety, but Ankara went against him by 51.15%. Those bureaucratic heartlands, with their concentrations of MHP voters, were won over to the NO campaign partly by these dissident ultranationalists. What saved the day for Erdoğan was the Kurdish vote. Out of 19 Kurdish-majority provinces 10 voted YES (Adiyaman, Bingöl, Bitlis, Elazig, Erzincan, Erzurum, Kars, Malatya, Muş, and Sanliurfa). Out of 5.5m people in those areas, 3m voted (54.5%) YES; the crucial development being, however, of a shift in votes which occurred in NO-voting areas like Hakkari, Şırnak, and eastern Ağrı (as well as YES areas like Muş) compared with the November 2015 AKP results. This handed over nearly 1m votes to bail out the YES camp. Within hours of the failure of the insurrection the dissident MHP MPs were appealing to Bahçeli to keep them on. The constitutional amendments passed on April 16 will come into effect in March 2019, when new presidential and parliamentary elections will be held, if and only if a whole raft of new supporting laws can be passed in the meantime. Erdoğan’s ability to effect legislative and constitutional change has been based on an unshakeable core support of about 32% of the Turkish population. The “black Turk” meme used in his speeches exploits the divisions in Turkish society left over from the Atatürk legacy. But if he didn’t ally himself with other sections of what is a “multi-polar” society by using the “big tent” approach for which he is renowned, he could never have achieved the majorities which have propelled him forward so far. It is the perception that PKK violence and Gülenist subversion is supported by foreign powers that gives Erdoğan not only his majority, but the backing of a post-Ataturkist (Kemalist) establishment. Clearly, the concern is: what now? Is the future trajectory different from the past? Close analysis of the constitutional changes point to the fact that although Erdoğan has indeed bought himself some extra time in power, nothing really changes. If an opposition with a credible programme forms the right alliances, there is as much if not more chance for it to replace Erdoğan (for instance in the March 2019 elections) as in the past. The legal opinions issued by the Venice commission which decry the April 16 constitutional amendments present objections that are typical of formulaic EU institutions working through templates and directives. They focus especially on the ability of the presidency to issue executive orders, the concurrent nature of presidential and parliamentary elections, and the ability of the presidency to dissolve parliament. But as with all formalism, which cannot see the wood for the trees, it is not only myopic but wrong about what Turkey is trying to achieve. For instance, parliament can actually pass a law by a majority vote, which immediately replaces any executive order from the president. Moreover, the presidential impeachment processes put in place by the new constitution do have more teeth than its critics concede. The Venice Commission fails to recognise that really nothing has changed in a system where the dissolution of parliament is not possible without the simultaneous resignation of the president and where a concurrent cycle elects presidents and MPs at the same time. All that has happened is that the “prime minister” has simply become “president”. If there is no change there, significant changes however that will take place as laws are passed prior to March 2019 will shape the actual nature of the administrative structure, especially with regard to the intelligence services and the armed forces. It is these last aspects of the new reforms which Erdoğan has long sought to bring into a centralised and reduced structure, in order to consolidate the “security state”, to use the terminology from Hans J.Morgenthau’s School of Political Realism, on which the country’s sovereignty is deemed to depend. Crucially, on this, likewise, depends the “democratic state” and all its institutions. If the US and Europe struggle in the modern age to keep the correct balance between these two aspects of the modern state, Middle Eastern states suffer not so much from an imbalance between them, as from a spectacularly overbearing “security state”. However, if we have learned no more from the Arab Spring, we have at least learned that this unfortunate situation has been caused as much by the presence of the western security state in the region as by anything else. Independence from this particular interference is necessary for democracy to succeed in the region. This is essentially what Erdoğan's Turkey is trying to achieve. If Erdoğan and the AKP are seeking structures to minimise the kind of foreign interference in Turkish affairs witnessed in the events being related here, it is inevitable that Kurds will be granted federal status eventually, as Erdoğan undertook way back in 2005 when he said ‘the Kurdish problem is my problem’. Then the PKK will have to face not the Turkish state, but the Kurdish constituency itself, and the lever European powers have over Turkish politics will disappear. If Erdoğan succeeds in putting the security state fully under civilian control in Turkey in a centralised fashion, the traditional competition between different deep state actors will end, together with their solicitation of different foreign backers to pursue colliding interests. The resulting stability will allow the democratic state inherent in the multi-polarity of Turkish society and culture to flourish.